How fabulously excessive is this jewelry look? The combination of heavy crystal statement necklaces with a nameplate à la Carrie Bradshaw is enough to make my head spin, but add in some emerald cocktail rings and a hand and ring chain and you have me applauding. Sometime I love loading on the baubles...usually it's when the rest of my outfit is very very simple! Ha, a Kardashian impersonator!! yesterday I attempted to pull off Scott Disick-y hair- you'll have to check it! Kardashians we're coming for ya!! those gems are priceless! love the flying dove! layer 'em up & live it up!!! gorgeous! that ring chain is so cool, love it!! Great look! 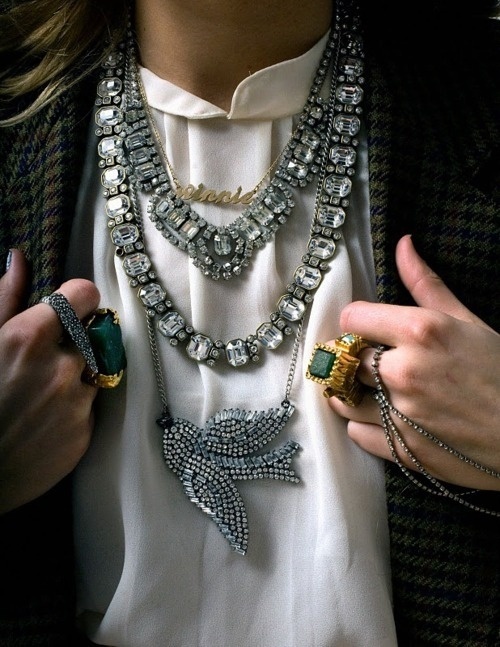 With jewellery I am all about the excess! Loving these! I don't know if I could pull it off though. The look is stunning and I'd love to see it translated into real life! the rings are all so gorgeous! Yessss, pile it up! I still wear my nametag also. Hahaha yes a little too much bling can look a bit too wannabee A lister but it does photograph well! Love the picture as inspiration. Makes me want to pile on some necklaces.